Romantic, inviting, and utilitarian. Fireplaces have the power to set the tone for an entire room. Whether your design preferences are ultra-modern or lean toward a cabin-in-the-woods vibe, creating a fireplace focal point quickly transforms any room into your favorite gathering space. Here are some of our favorite hearths that complement just about any decor. If you like clean lines and earthy elements, a cut-out fireplace with natural stone and tile makes a statement from both sides. 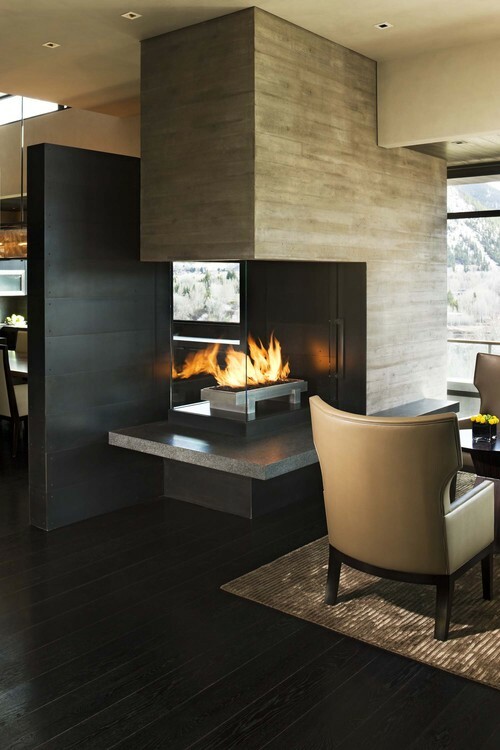 This fire feature keeps the room feeling airy and spacious and offers an interesting visual element from all angles. Warm neutral tones on the floor and furniture provide balance and harmony. Do you feel like you stepped back in time to a simpler era, when families cooked over an open hearth and enjoyed a leisurely dinner around the adjacent dining table? This German-style farmhouse dining room invites guests to linger at the table long after they’ve finished the meal. 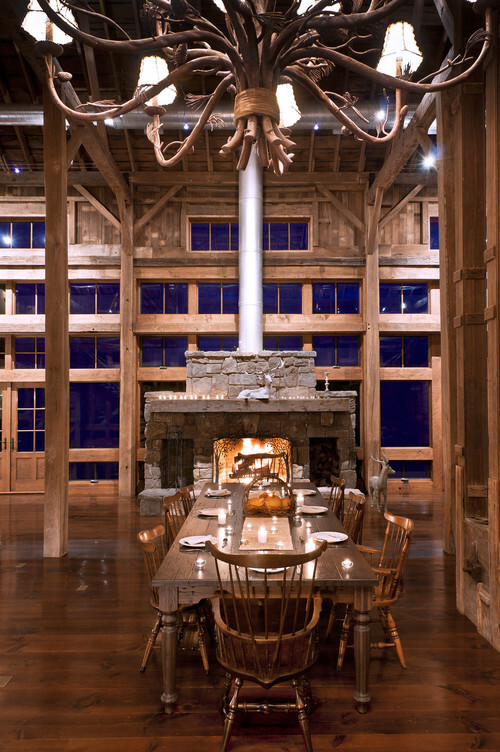 The oversized stone fireplace is larger than life and the perfect size for the wide open space. 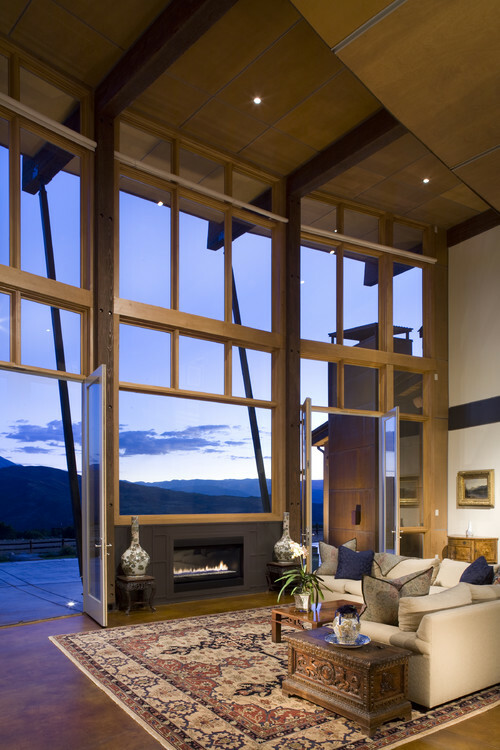 The metal pipe chimney is unobtrusive so you can still enjoy the wall of windows. There’s a great debate among professional designers about whether or not you should hang a flat screen TV over the fireplace. We say if you’re going to do it, make it look like the TV is supposed to be there; make it part of the fireplace, rather an afterthought. This relaxing, casual living room artistically incorporates the family television into the architectural design of a traditional style fireplace. It’s perfect for watching movies while enjoying the warm glow of the gas flame. This two-story living living room is the perfect mix of traditional and contemporary. Each element works together to lead you toward a spectacular view of the surrounding landscape. The rectangular gas fireplace provides warmth without taking up too much space, so you can enjoy cozy surroundings yet still feel like you’re outside. It’s hard to decipher between indoor and outdoor space, which is, of course, the whole idea. 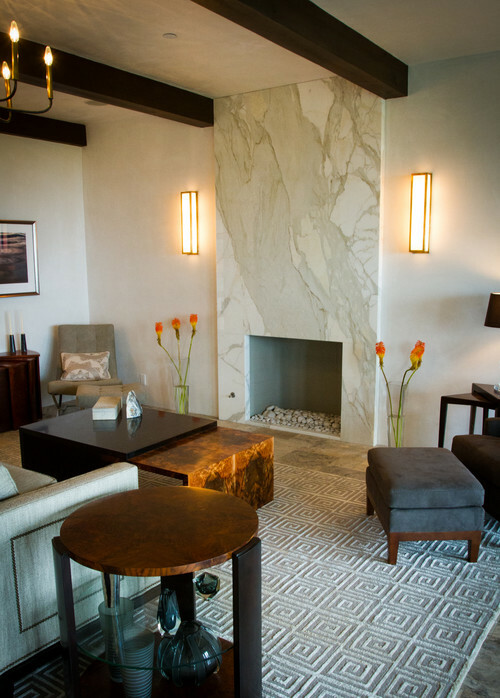 A floor-to-ceiling slab of marble or granite creates a dramatic focal point for the fireplace in a contemporary setting. While neutral tones dominate the walls, dark wooden beams and the warm colors of the furniture make the room feel intimate and inviting. Dim the lights and relax in front of the fire in this enticing setting, complete with an unexpected Greek key pattern on the area rug, just for fun.